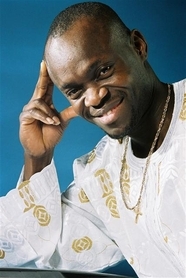 Jùjú is a style of Nigerian popular music, derived from traditional Yoruba percussion. The name comes from a Yoruba word "juju" or "jiju" meaning "throwing" or "something being thrown." Juju music did not derive its name from juju, which "is a form of magic and the use of magic objects or witchcraft common in West Africa, Haiti, Cuba and other South American nations." It evolved in the 1920s in urban clubs across the countries, and was believed to have been created by AbdulRafiu Babatunde King, popularly known as Tunde King. The first jùjú recordings were by Tunde King and Ojoge Daniel from the same era of the 1920s when Tunde King pioneered it. The lead and predominant instrument of Jùjú is the Iya Ilu,"' talking drum. Some Jùjú musicians were itinerant, including early pioneers Ojoge Daniel, Irewole Denge and the "blind minstrel" Kokoro. Afro-juju is a style of Nigerian popular music, a mixture of Jùjú music and Afrobeat. Its most famous exponent was Shina Peters, who was so popular that the press called the phenomenon "Shinamania". Afro-juju's peak of popularity came in the early 1990s. Following World War II, electric instruments began to be included, and pioneering musicians like Earnest Olatunde Thomas (Tunde Nightingale), Ambrose Campbel, Fatai Rolling Dollar, I. K. Dairo MBE, Dele Ojo, Ayinde Bakare, Kayode Fashola, Adeolu Akinsanya, King Sunny Adé, Ebenezer Obey, Prince Adekunle, Admiral Dele Abiodun, Segun Adewale, late lady Oladunni Decency, YK Ajao, Toye Ajagun, Idowu Animashahun, S.I Atolagbe, Dayo Kujore, Champion Kunle Opio, Ahuja Bello and lots more made the genre the most popular in Nigeria, incorporating new influences like funk, reggae calypso, makossa, samba, jazz and Afrobeat and creating new subgenres like yo-pop. Some new generation juju artistes include Dele Taiwo, Wale Thompson, lady Ayo Balogun, Diya Ojo, Dele Bravo, and Bola Abimbola. Although Juju music, like apala, sakara, fuji, and waka was created by Muslim Yoruba (NOTE: Tunde King was a Muslim and an alhaji until his death in the 1980s); however, the music itself remains secular. King Sunny Adé was the first to include the pedal steel guitar, which had previously been used only in Hawaiian music and American country music. Jùjú music is performed primarily by artists from the southwestern region of Nigeria, where the Yoruba are the most numerous ethnic group. In performance, audience members commonly shower jùjú musicians with paper money; this tradition is known as "spraying." One of the centres of the performance of Jùjú music is in Ibadan, Lagos, Ilesa, Akure and Ondo. Most jùjú musicians are based in the zone of market forces, and most of these are in an area of immigrant neighbourhoods. There are several contexts in which jùjú music is performed. On of these contexts is ‘The Hotel’. The Hotels are concentrated in the immigrant areas and they serve as taverns, dance halls and brothels. They range from very small wooden structures to clusters of two or three building with a stage in the middle. Most activity takes place after nine pm and the hotels are the centre of Ibadan’s nocturnal economic structure. One of the economic activities associated with the hotels is the sale of drinks and food and also prostitution. The Hotels are seen as places of relaxation, where patrons, mainly men, come to escape every day life. They are places where people can come to do things that they might not want to be seen doing at home. The Jùjú music performed is not the focus of the venue but most patrons prefer live music to records. The bands that perform do not have a guaranteed wage; instead they rely upon donations from patrons. Most bands will only perform during the weeknights, leaving the weekends free for more lucrative gigs. Another context in which Jùjú music is played is at celebrations called àríyá. These celebrations are parties which celebrate the naming of a baby, weddings, birthdays, funerals, title-taking, ceremonies and the launching of new property or business enterprises. These events are sponsored so the musicians are guaranteed payment. The wealth of the hosts and the guests is shown through their reward to the entertainers. It is customary to press the contribution to the musician’s forehead so that everyone can see how wealthy they are. The musicians will often return good payment with praise songs to the donors. Live music is crucial to the proper functioning of an àríyá.